This is the starting point for businesses and computer users that want to optimize performance and health! Computer athletes are sitting hunched over the computer for long hours day after day! They are continuously keyboarding, repetitively mousing and endlessly staring at the monitor! Then the computer athlete is reporting fatigue, discomfort and pain! Some computer athletes are experiencing numbness, tingling, or stiffness. Across the aisle, others are emotionally trying to work through headaches, eyestrain, stiff neck, sore shoulders, and back aches. These health issues develop slowly, sneaking up on you, often hitting you when you’re under pressure. These physical stressors on the body turn into injuries such as carpal tunnel syndrome, tendonitis, and mouseitis. The unhealthy situations listed above added to ergonomic inefficiencies in your workplace wastes profits. At Ergonomically Correct, we believe your people are your most valuable asset. We are dedicated to improving the performance and health of computer users, while minimizing exposures to ergonomic risks. Ergonomics is a smart initiative to promote continuous improvement. Companies rely on us for noticeable ergonomic improvements. Our “Feel Better – Work Smarter” evaluations have proven to be very effective. 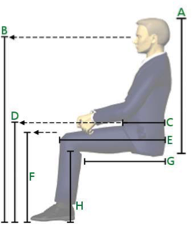 We provide the best ergonomic evaluations, training, and products. We partner with organizational leaders, your colleagues, and YOU the computer athlete. Clients appreciate how easy it is to work with us. We know that setting up your work station may seem intuitive but it takes deliberate effort to work productively and healthy. A study coordinated by health-research consulting firm Health and Work Outcomes, states that “Individuals who received office ergonomic training and sat in an adjustable chair increased average productivity by 17.8%”. Working in the health and safety field allowed us to see the lack of ergonomic knowledge and the human suffering among countless computer users. In addition, my background as a continuous improvement leader allowed us to recognize too many compounding ergonomic inefficiencies in the workplace. These three factors (lack of ergo knowledge, human suffering, and inefficiencies) convinced us that there was an urgent need to help businesses become more productive and efficient and to help computer users prevent real pains. To meet the growing demand for ergonomic services we started Ergonomically Correct LLC. By combining the science of ergonomics, wellness, and continuous improvements we deliver practical solutions that impact productivity, health, and comfort. During evaluations computer users tell us repeatedly: “I didn’t know that!” After applying ergonomics we regularly hear the computer user say: “I feel better already!” Our passion to help people and our innovative approach delivers meaningful results. Clients say that we can, "Increase profits by enabling employees to increase their contribution." Isn’t it's time to begin putting our strategies to work for your benefit?